Sarah Lopez says she simply wouldn’t be where she is today if it wasn’t for her time in the WomenLead program. A double major senior, Lopez said the semester-long course gave her all she needed to land her job within a startup business. “It’s a huge corporation, I was surprised that they would be hiring someone who they’ve never heard before, plus I’m a student, and this is a full-time position,” she said. But she credits the confidence and her ease during interviewing to the Georgia State program that first challenged her to start looking—and applying—past her comfort zone. And it’s hard to aspire to anything less with a leader like Dr. Nancy Mansfield. Founder of WomenLead and professor of Legal Studies, Mansfield has been a member of the Robinson College of Business for over 30 years and was one of the first women to join her department. Mansfield has won Georgia State’s Outstanding Service to Students Award and also serves as a founding member of the university’s Steering Committee of the Women’s Philanthropy Initiative and as vice-chair of the Board of Trustees of the Atlanta Girls School. Now, she’s spearheading the WomenLead program, a hidden gem which, in a little less than three years, has grown from 27 to 421 students—and counting. 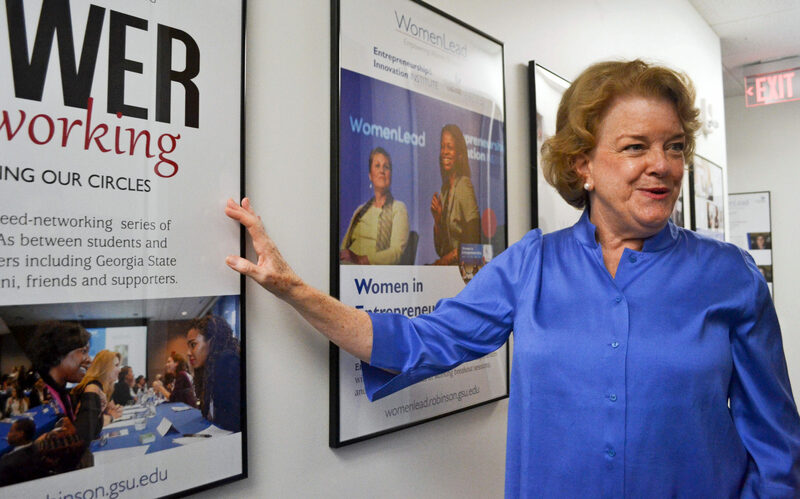 Georgia State’s WomenLead program kicked off its first class in 2015, funded by a Georgia State alum, an angel investor motivated to level the playing field for women in the workforce. According to Mansfield, similar programs across the nation exist but often focus on MBA students, or students who already have attained some kind of professional experience. The program is distinctive, she said, in that it provides four-credit elective courses aimed specifically at undergrads. Currently offering a course in Business, Policy & Politics and Science, Mansfield said she hopes to soon expand WomenLead into the departments of Arts, Entrepreneurship and Technology. And outside the classroom, there’s a lot more students are exposed to. Conferences, luncheons and a spin-off on speed dating—where you get a few minutes to chat with employers from Atlanta’s most competitive industries—are some of the events the program puts together. And locally, WomenLead has been attracting employers interested in possible new hires, or simply looking to help fund or engage with the program. “We have over 350 people in our database, mainly women but also men, who say, ‘I want to help with the program, but also interact with the students,’” Mansfield said. And those interactions, according to WomenLead Project Coordinator Maria Tortolero, are what often kick off relationships between students and mentors. Today, women earn more degrees than men nationwide and make up nearly half of the nation’s workforce. But despite an important conversation that has begun, hurdles like sexual assault and gender wage gaps continue to impede women’s success in the workplace. For Mansfield, one of the greatest challenges women face today is learning to put their name in the hat. Today, she says, the interest for a diverse workforce is unprecedented. “Women make 85 percent of the purchasing decisions in every family. So if you have a marketing team, you need women,” Mansfield said. As one of the 22 women in her first law school class, she learned it’s all about confidence: Confidence in the self, in the professional world of work and in the community. In other words, imagining your best self, imagining what the professional world looks like for you and finally, always keeping your community in mind. To help students explore community engagement, WomenLead is gearing up to start new projects engaging students in politics, nonprofit and volunteering efforts with a focus on keeping their professional evolution in sync with their civic engagement. Nothing. WomenLead covers all class costs and still counts as four elective credits towards a degree. They cover everything down to your pens. For each student that comes to the program, Tortolero said, it costs about $1,000 because they get “the journals, the pens, the bags, so basically you have everything about WomenLead you’re going to use.” And no extra fees for the events you’ll attend either. For more information on the WomenLead program, click here.